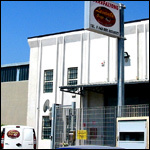 Near Bari (Apulia, south Italy), in the “Zona Industriale” of Capurso,. In Via Votano, 300m. - far from the S.C. Marrone in Strada Statale 100 Bari – Taranto.